My husband made this wonderful Bacon & Swiss Quiche for Christmas while my daughter and her husband were visiting with us last year. The four of us demolished it! Several years ago we purchased the Betty Crocker Christmas Cookbook which has become a go to favorite of ours when entertaining. I’m sure there are many Betty Crocker Christmas cookbooks so I have posted an Amazon affiliate link at the bottom on this post so you can see which cookbook is correct. It is full on wonderful favorite recipes with beautiful pictures and easy to follow directions. We have Post-it tabs on quite a few pages. I have to tell you about those Christmas dishes the quiche is being served on. I purchased the first set at Dollar General so many years ago, I can’t even remember. Anytime I see a matching piece at a thrift store or yard sale, I pick it up. My collection continues to grow. I love using them during the Christmas season! I know it is almost Easter and I’m talking about Christmas! Easter makes you think of eggs, right? Thinking about eggs made me think about this awesome Bacon & Swiss Quiche. My husband cooked extra bacon because, well apparently there is no such thing as too much bacon! Have you ever made a quiche? 1 In medium bowl, mix flour and 1/2 teaspoon salt. Cut in shortening, using pastry blender (or pulling 2 table knives through ingredients in opposite directions), until particles are size of small peas. Sprinkle with cold water, 1 tablespoon at a time, tossing with fork until all flour is moistened and pastry almost leaves side of bowl (1 to 2 teaspoons more water can be added if necessary). 2 Gather pastry into a ball. Shape into flattened round on lightly floured surface. Wrap flattened round of pastry in plastic wrap and refrigerate about 45 minutes or until dough is firm and cold, yet pliable. This allows the shortening to become slightly firm, which helps make the baked pastry more flaky. If refrigerated longer, let pastry soften slightly before rolling. 3 Heat oven to 425°F. Roll pastry on lightly floured surface, using floured rolling pin, into circle 2 inches larger than upside-down 9-inch quiche dish or glass pie plate. Fold pastry into fourths; place in quiche dish or pie plate. Unfold and ease into dish, pressing firmly against bottom and side. 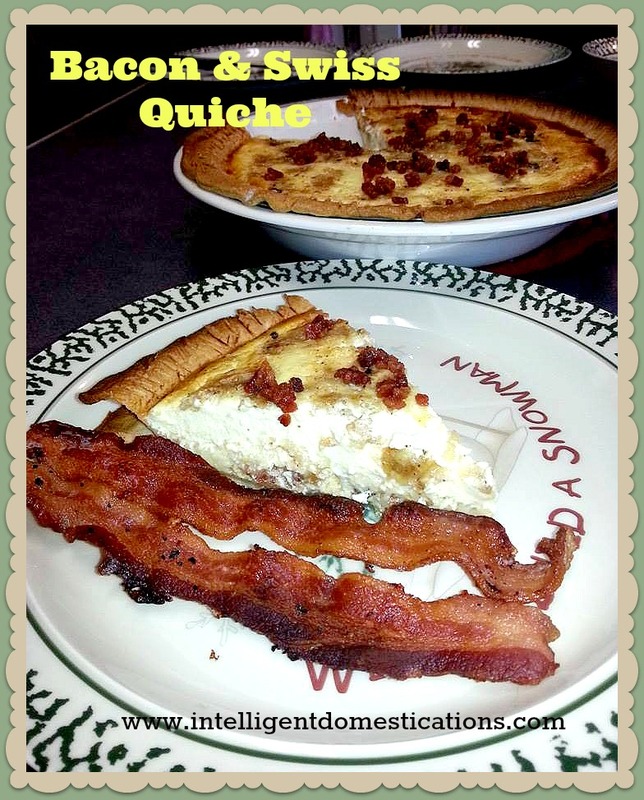 4 Sprinkle bacon, cheese and onion in pastry-lined quiche dish. In large bowl, beat eggs slightly with fork or wire whisk. Beat in remaining ingredients. Pour into quiche dish. 5 Bake 15 minutes. Reduce oven temperature to 300°F. Bake about 30 minutes longer or until knife inserted in center comes out clean. Sprinkle with additional bacon. Let stand 10 minutes before serving. We love Quiche, thank you for the recipe. I love simple recipes. I like quiche. I’ve never used flour in mine. Does it improve the texture? That looks SO yummy!!! I’ve never made a quiche, but I’ve been looking for a good recipe for one! Perhaps this is it! This is a really good recipe! It’s a keeper. I’ve made my fair share of quiches for women’s events at church. And they are perfect for breakfast or brunch when entertaining house guests. The bacon and Swiss is something my husband would love. Looks like a keeper! Thanks for sharing. Yes, Alli. It sure is a keeper. My son-in-law and husband finished it off! Sounds yummy! I do not remember making any quiche…..Actually, maybe one time a years ago. I guarantee, it did not turn out as delightful as yours…lol… And I agree, one can never have too much bacon. I tried to be healthier and switch to turkey bacon but it just does not taste the same. As far as the dishes, sometimes those low cost items become some of our most favored! We like turkey bacon, it’s actually very tasty but the ‘real’ stuff is best! You are so right about those thrift items, they are always my personal favorite! Ahh – I love having quiche on the weekends. This sounds wonderful! Glad you liked it. This is a really good recipe.